One glass per day for 12 weeks improved brain function and cognitive abilities. 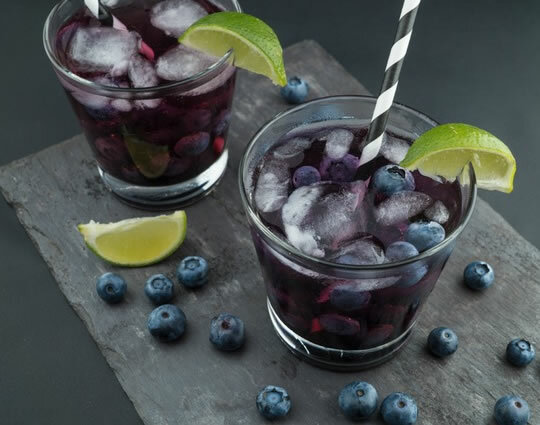 Concentrated blueberry juice improves cognitive function in older people, new research finds. The boost to brain power is likely down to the flavonoids in blueberries. Flavonoids have antioxidant and anti-inflammatory properties. “Our cognitive function tends to decline as we get older, but previous research has shown that cognitive function is better preserved in healthy older adults with a diet rich in plant-based foods. For the research, 12 people were given the equivalent of 230g of blueberries in a concentrated juice each day for 12 weeks. The remaining 14 were given a placebo. After 12 weeks, all were tested for brain function and cognitive abilities. Antioxidants are key to the beneficial effect of blueberries. A previous study also found blueberries stave off brain ageing, as do walnuts and strawberries. The results for memory in this study were marginal. However, previous research has found that blueberries can improve memory and cognitive function. The study was published in the journal Applied Physiology, Nutrition, and Metabolism (Bowtell et al., 2017).